The medley of measures taken by the President of the Republic are a veritable fire brigade and translation of the zeal to see peace reign in the country. 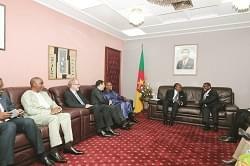 The past few years have put peaceloving Cameroonians to test. For a country that has long been referred to as the Island of peace, this situation has really put its people in a state of total confusion. But as a nation that gained maturity more than half a century ago, there seem to be no reason why this moment of trial should serve as a trap and disrupt its track to peace. Cameroonians are not at ease with this state of affairs and as fate would have it, all eyes are turned on the President of the Republic who, by virtue of the powers conferred on him by the constitution has the duty to ensure that peace and security reign among his compatriots. The litany of measures so far taken in this light tells of the President's determination to bring back the country to normalcy. "As guarantor of institutions under our Constitution, and in particular of national unity, it is my duty to restore order...", President Paul Biya told the visiting Secretary General of the Commonwealth, Patricia Scotland, during a State luncheon last December. Some of the measures taken to scale down the euphoria of Boko Haram terrorist group, one of the early threats to security include: the mobilisation of the national defence forces and contribution to the Mixed Multinational Force formed under the aegis of the African Union. The impact, according to the President of the Republic has been far reaching. In the same vein, the government does not seem to have left a stone unturned in providing a solution to the problems raised by both Anglophone lawyers and teachers. These include: the setting up of an Adhoc Committee charged with examining proposals for solutions to the concerns of Anglophone lawyers. On the instructions of the Head of State, the Minister of State, Minister of Justice and Keeper of the Seals set up a working group comprising the Minister of Higher Education, the Minister of Public Service and Administrative Reforms, the Minister of Finance and the Director General of ENAM. All these were aimed at reviewing the problems raised by Anglophone lawyers and proposing solutions to the appreciation of the President of the Republic. 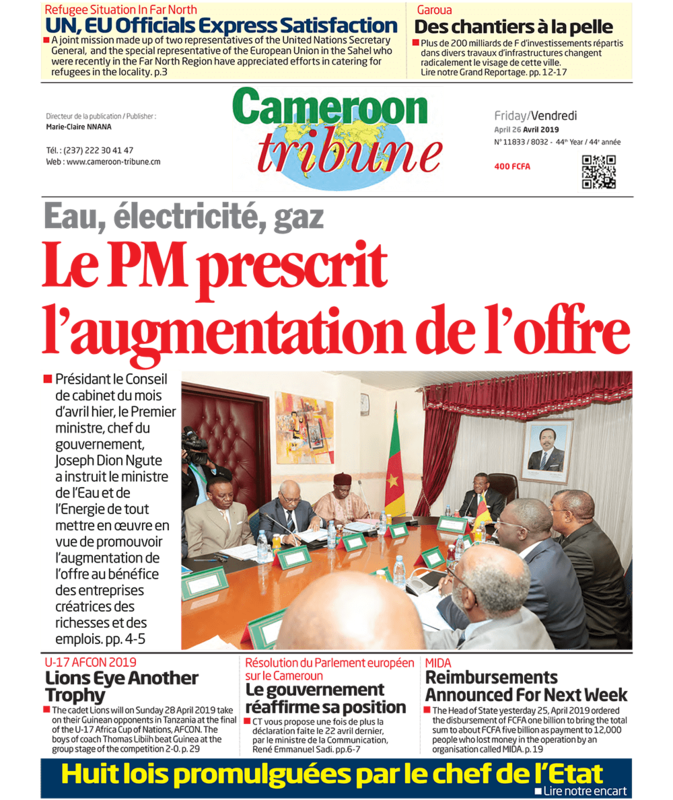 Answered Questions In effect, the President of the Republic already provided answers to some of the concerns of the Anglophone lawyers by instructing the amendment of the organisation and functioning of the Supreme Court to include the Common Law section. The School of Administration and Magistracy (ENAM) now has a Common Law section on the instructions of the Head of State who has equally ordered the recruitment of Anglophone teachers at the Magistracy and Registry Divisions of the school. A special recruitment of English Speaking pupils Judicial and legal officers as well as court registrars over a period of four years based on quotas has been ordered. Instructions have been given for a census of judicial and legal officers of English expression to be made aimed at increasing the number of judicial and legal officers at the nation's highest court. Following the prescriptions of the Head of State, the Faculty of Legal and Political Sciences has been created in the University of Buea and the department of English Law in the Universities of Douala, Maroua, Ngaoundere and Dschang similar to that in the University of Yaounde II Soa. These and many other measures have been taken in response to the claims of the Anglophone lawyers. Two commissions were created, all in a bid to handle the problems raised by Anglophone teachers. Several meetings have been held and solutions proposed and executed. One of the major decisions taken by the President in order to enhance peace in the country was the creation of the National Commission for the Promotion of Bilingualism and Multiculturalism "to propose solutions to maintain peace, consolidate our national unity and strengthen our resolve to live together from day to day." In addition to this, instructions were giving for the recruitment of 1,000 bilingual teachers in the science and technical subjects. From every indication, these and many other measures are aimed at ensuring that the country remains an Island of peace in the Central African sub region.